Set-up and imaging results of three-dimensional imaging lidar system adopting the high speed pseudorandom modulation and photon counting techniques. With the advantages of low peak power emission and high imaging speed, high-resolution three-dimensional images of the targets in the range of 1.2 km have been successfully obtained by the system. Laser radar technology has been developed rapidly since the advent of laser. Among various laser radars, the three-dimensional (3D) imaging lidar has been of great concern. The traditional 3D imaging radar based on direct detection mode has two main ways: The first method is to use a single pulse of high peak power for time-of-flight ranging. This method requires a laser capable of producing pulsed laser with high peak power and narrow pulse width, which is expensive and difficult to manufacture and cannot be miniaturized. The second approach is to use time-correlated single-photon counting techniques. Although this method can work with low peak power laser pulses, it requires a long pixel dwell time to establish the distribution of photoelectrons, which seriously reduces the imaging speed. 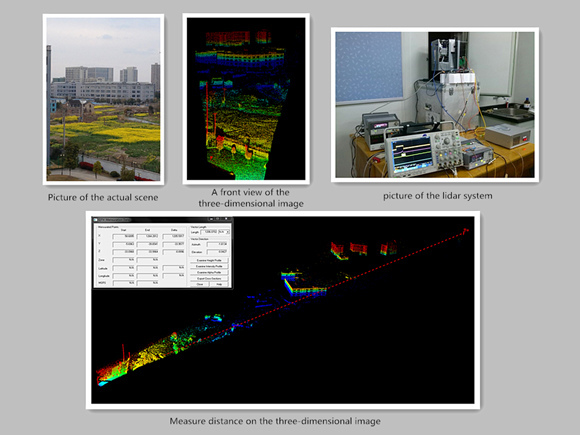 In order to overcome the above problems, the research team led by Chen Weibiao from Shanghai Institute of Optics and Fine Mechanics, Chinese Academy of Sciences, carried out the research of 3D imaging lidar based on high-speed pseudo-random code modulation and photon counting, and verified it in outdoor environment. Related research results are published in Chinese Optics Letters, Volume 14, No. 11, 2016 (Y. F. Zhang, et al., Three-dimensional imaging lidar system based on high speed pseudorandom modulation and photon counting). The principle of the 3D imaging lidar based on high-speed pseudo-random code modulation and photon counting is as follows: Pseudo-random codes have sharp autocorrelation value and very low cross-correlation value, so the position of pseudo-random codes can be extracted from noise by correlation operation. The target distance can be obtained by calculating the time between the transmitting and receiving of the modulated laser. In this method, low power emission and single photon reception are adopted. Both the peak power requirement of the laser and the pixel dwell time are reduced. The advantages of low peak power and high imaging speed make it possible to reduce the size and power consumption of the system without sacrificing the imaging speed. The results of the outdoor imaging with the target distance of 1.2 km are reported in this paper, and high-quality 3D images are obtained. Prof. Chen Weibiao believes that the advantages of high sensitivity and high imaging speed the technology possesses make it suitable for long-distance three-dimensional imaging and detection, such that the technology has a great development potential. Further work is to achieve system miniaturization and low power consumption and to enhance SNR in the high noise level conditions.